Need to stay in Markham? 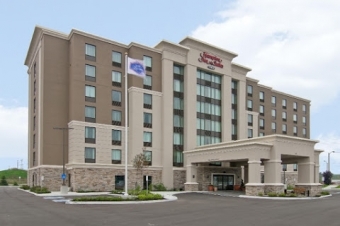 Check out the Hampton Inn & Suites by Hilton Toronto Markham near Toronto, Ontario! Find this Hampton Inn & Suites by Hilton Toronto Markham hotel conveniently located off highways 407, 7 and 404; just ten minutes from Main Street Unionville, Markham Civic Center and Flato Markham Theatre. Discover extensive shopping and dining opportunities also just ten minutes away at Markville Mall. Guests can enjoy easy access to Downtown Toronto and the entertainment district – only 25 minutes from this modern hotel in Markham, Ontario.